"Wakefield as a community began in 1639 when a small group of Lynn (also known as Linn) residents petitioned the General Court of the Massachusetts Bay Colony for an inland plantation at the 'head of their bounds.' Permission was granted a short time later and in 1644 Lynn (Linn) Village was incorporated as the Town of Reading (Redding). Twenty-nine men and their families moved themselves and their belongings over the terrain and settled in Wakefield. These pioneers adopted a modified democratic government in 1647. The land holdings increased when the General Court gave the settlers 2 square miles of land in 1651. (Today, this additional land encompasses most of North Reading). As the number of settlers increased, political differences between the community's segments also grew during the next century. These differences did not inhibit the community from unanimously adopting the colonists' cause during the Revolutionary War and accepting the Declaration of Independence which they pledged to 'adhere to its sentiments, and stand by it to the last with their lives and their fortunes.' The long-standing political differences centered around a conflict between the Democratic Republicans (Wakefield - the First Parish) and the Federalists (North Reading - the Second Parish and the present day Reading - the Third Parish). On a mutual vote, the Second and Third Parishes voted to send a Federalist representative to the General Court, leaving Wakefield without representation. The differences could no longer be resolved and in 1812, the citizens of Wakefield split from the town of Reading and obtained a charter. Wakefield was now known as South Reading. South Reading continued to grow and in 1868 the town of South Reading changed its name to 'Wakefield' in honor of Cyrus Wakefield, the man who is credited with changing the course of Wakefield's history. It was Mr. Wakefield who brought the rattan industry, and its enormous profits, into the community. 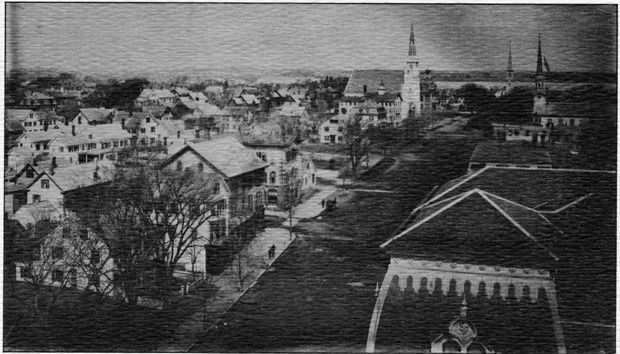 As a gift to the community, Mr. Wakefield donated the money;Caption: This photograph was taken from the top balcony of the old Town Hall and shows a northerly view of the downtown area. Prominent buildings include (from left) the Ira Wiley House (now the Olde Theatre Block) the Perkins Block on the South corner of Albion Street the Kingman Block on the north corner of Albion Street the Emerson Shoe Factory (now the Y.M.C.A.) the Baptist Chrch (erected in 1871) the Lafayette School (the old high school, erected in 1872) the old Congregational Church (at the end of Main St.) and the Universalist Church to the right. “Wakefield center, 1890,” NOBLE Digital Heritage, accessed April 22, 2019, https://digitalheritage.noblenet.org/noble/items/show/7116.